Under this tab of the campaign you can attach your Landing Zone(s) to the campaign. Select the Design that you would like to attach. This displays the Alias of the Landing Zone. This shows the name of the design that has been attached. This shows the reference number of the Landing Zone. 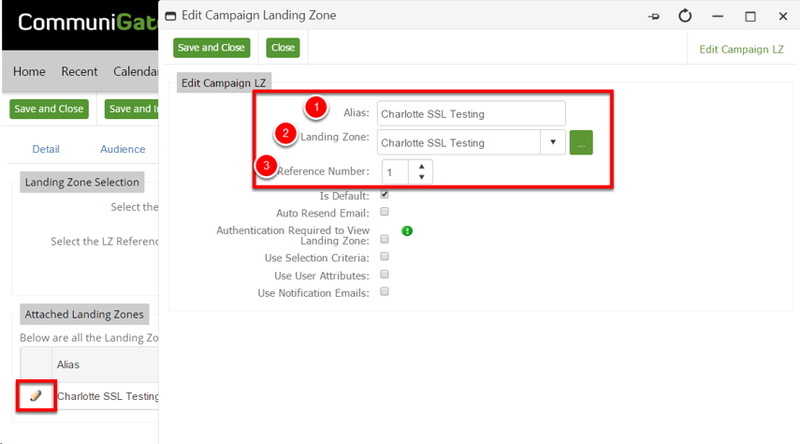 The Is Default option is used when multiple Landing Zones are attached to the campaign with the same reference number and Selection Criteria is used. Selecting is default means if the contact doesn't meet the criteria of any of the options then they will be shown the default Landing Zone. This option is useful if the contact has updated their preferences to say that they would like to receive either HTML or Text the resend will then be of their preference. This indicates if Authentication is switched on for the Landing Zone. This button brings up the pop up to assign Articles to the Landing Zone. This button brings up the pop up to assign Dynamic Content to the Landing Zone. To Access the advanced details select the pencil icon. The Alias is used to mask the name of the Landing Zone in the browser or better describe the Landing Zones on the campaign. Editing the reference number for the Landing Zone. 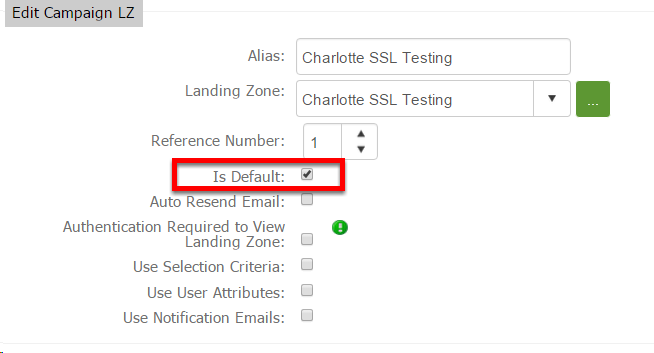 "Is Default" is used in conjunction with "Use Selection Criteria" so that if a contact does not meet the criteria of the condition set on the other Landing Zones this Landing Zone is used by default i.e as a backup.